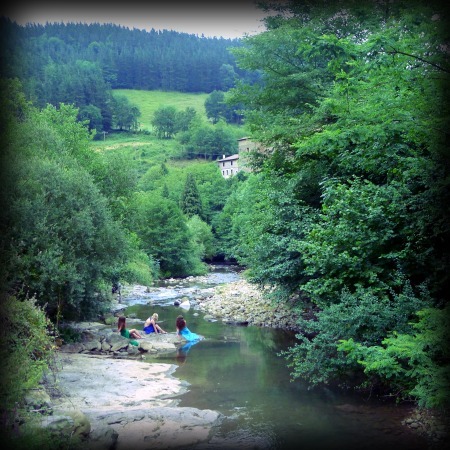 Joxemiel Barandiaran was a Basque ethnographer and priest, born in Ataun, the village where we are spending the summer. He is credited with re-discovering and preserving many of the traditions of these hills and even has a museum in San Gregorio (the second neighborhood of Ataun). Last night was a special celebration of him and the legends that he helped bring back to the collective memory. The celebration consisted of a 3km walk, part at dusk and part at nightfall, beginning in the old home/mill where the museum is housed. Before beginning, there was chorizo, bread and cider for all. Our neighbor/friend/godsend Tere took us around back to meet the breadmaker and check out the oven. Then the walk began, 500 people, young, old, man, women and children walking more or less in single file down a narrow country road. Every so often, we'd stop for a sighting of some mythological creature. In a clearing, we were held up as an old Basque man staggered down from the woods with a basket heavy from apples. He explained they were for the river witches, or lamiak in Basque, to curry favor with the beautiful web-footed women. Then, a while down the path, the jentilak, giant mountain dwellers that coexisted (according to legend) with the Basques, came down to join us on the trek. We stopped to talk with Martin Txiki, the sneaky little guy who stole all the mountain giants' secrets (along with their wheat). Then, the fall of night. Everyone had torches as we walked along the sometimes perilous rocky trail that runs alongside the creek. Can't tell you how many times the word 'lawsuit' went through my head. America, why don't you let us do cool stuff like this anymore? Then a stop with a group of witches, dancing around the fire and maltreating a young girl tied to a tree. ❤. C. said that this was the most special thing...that it by far beat any expensive Baptist Christmas extravaganza he'd ever attended. And he's right...there was something beautiful about the young people mixing with the old. Everyone coming together to appreciate and remember their roots, celebrating legends that still live on, legends that still seem plausible when set against dark, misty mountains.